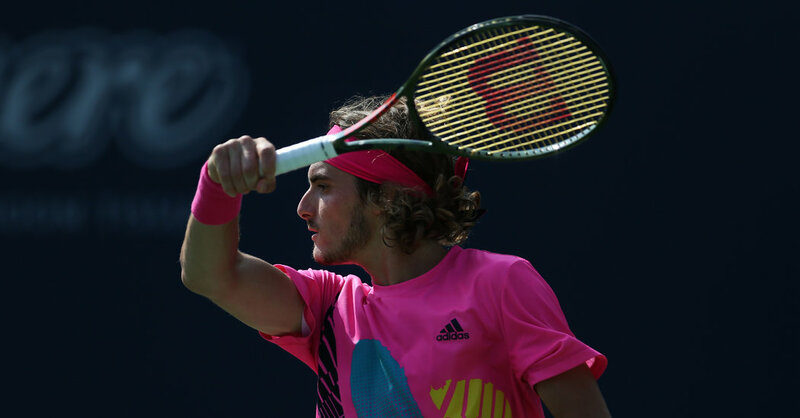 TORONTO — Everything about Stefanos Tsitsipas is big and bold, which sets him up perfectly to make a splash at the United States Open in two weeks. Start with his tongue-twister name (sit-si-pahs), his wild long hair and his bright pink shirt. Then look at his frame and his big game, which is at its best in the biggest moments. Built like an ancient Greek statue, Tsitsipas is 6 feet 4 inches and all sinewy muscle, giving him power on his serve without sacrificing agility. This clash of generations was a repeat of the Barcelona Open final this year, when Nadal defeated Tsitsipas, 6-2, 6-1. Nadal dominated the rematch with almost clinical ease, although the Greek made a spirited comeback before falling, 6-2, 7-6 (4). Tsitsipas, who was born outside Athens, has come a long way hailing from a country that is hardly a tennis hotbed. Last year at this time, he was ranked No. 168 in the world. After reaching the semifinals in Washington and the final in Toronto in the past two weeks, he rose to No. 15 on Monday. Fans at the Rogers Cup witnessed a shooting star last year when Denis Shapovalov of Canada made a run to the semifinals in Montreal as an 18-year-old. “I didn’t beat Rafa; he beat Rafa,” Tsitsipas said, getting laughs from the assembled reporters. Born to a Greek father and a Russian mother, who was a former No. 1-ranked junior player like her son, Tsitsipas started playing at age 3 with his parents, who worked as coaches at a summer resort in Greece. He is the eldest of four children. His sister, Elisavet, and brothers, Petros and Pavlos, also play competitive tennis. Tsitsipas preferred soccer early on, but that changed when he won a tennis tournament at 8 or 9. He began with a two-handed backhand and switched to a one-hander because he wanted to imitate his idol Roger Federer. A few years ago, he was swimming with a friend on a day off at a Futures event in Greece. He soon drifted out too far amid high waves, and struggled to stay afloat. His father pulled him to safety from the swirling sea, discovering a rock jutting out from the sea to support them above the waves and keep his son from drowning. That incident gave Stefanos Tsitsipas a new perspective on life and on tennis. He said he had zero fear on the court and understood there was a time to go for your shots and a time to hold back. The father-son dynamic can be challenging, especially when your father is your coach. That’s why Tsitsipas retreated to the British Virgin Islands earlier this year to be alone for a week. Now, his odyssey is the talk of the tennis world. In Toronto, he was embraced especially by the city’s large Greek community, with fans adopting him as their own, waving Greek flags and besieging him with autograph requests. It is not hard to imagine the scene being repeated soon with Greek fans in Queens at the U.S. Open. In his downtime in Toronto, Tsitsipas dined in the city’s Greek neighborhood, where the annual Taste of the Danforth street festival was taking place. After the crowd of 11,374 sang “Happy Birthday” to Tsitsipas on Sunday, he put the icing on the cake with a gracious signoff.